“Robin Olson of San Luis Obispo claimed he was attacked by a mountain lion Saturday afternoon while hiking in Prefumo Canyon. Robin Olson was hiking with his son around 5:30 p.m. They wandered off the trail and came in contact with a mountain lion. Olson told his son to run away, he said. 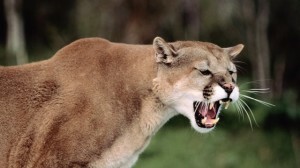 Olson tried to avoid the mountain lion, but the animal lunged at him and started attacking. The former wrestler grabbed the mountain lion’s neck. He held onto the cat’s neck as it was scratching him, Olson said. During the struggle, Olson broke the mountain lion’s neck, killing it instantly. He left with numerous scratches on his body. Olson said he regrets what happened and that he loves animals. He said he just happened to be in the mountain lion’s space by accident. His experience should be a lesson to other hikers to stay on the trails, he said. The California Department of Fish and Wildlife instructs hikers not to run if they come in contact with a mountain lion. Rather than running, hikers should make noise and try to look big by waving their arms. Kettle was right. I bought the hoax hook line and sinker. For those who think wrestling big cats to be fun and easy, these folks could use your help. Leopard problems? hand me that stick…..
A Superman wannabe to his kid! Well, at least CalCoastNews gave all the credit to KSBY that they deserve.